Hoover Nextra error 7 (as with all Nextra error codes) is shown by flashing two lights in a 15 second cycle, usually the start and pause, or start and delay-start leds. If you count how many times the lights flash before pausing and repeating the sequence and it amounts to 7 flashes then this page explains the meaning. Remember error codes are specific to one make or even one range of washing machines. An error 7 on an AEG for example will mean something different. These three explanations all refer to a specific fault where the washing machine knows it’s supplying power to the motor and that the power is running all the way through the motor and back to the main pcb. Therefore it knows the motor should be running – but it cannot detect that the motor is actually running. The first possible fault could be if the motor is trying to turn but the motor is physically jammed. This is likely to be rare. It’s easily tested by opening the door on the washing machine and spinning the drum by hand. If it moves normally and freely it’s clearly not jammed and this is not the fault. If it is jammed or very stiff then making sure the machine is disconnected from the mains supply you can just take off the drive belt. You can then see if it’s the motor or the drum that is jammed. If the motor is jammed it’s likely to need replacing but it’s rare for one to jam. This would cause the exact same problem in that the motor is trying to turn but because the drum was jammed it couldn’t. Again, easily tested by turning the drum by hand – if it’s free then it isn’t the fault. If it’s jammed or very stiff, removing the belt will let you determine whether it’s the motor or the drum that’s jammed. The way a washing machine detects the speed of the motor is via the tacho coil, which is the last potential fault listed. 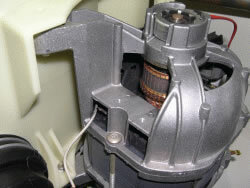 The tacho coil is on the motor under the motor plug cover. It’s at the end opposite to the drive belt with 2 thin wires running from it. It’s a small coil that surrounds the shaft of the main armature where a small round magnet is attached. As the armature turns, the magnet on the end of the shaft turns inside the coil. It’s then easy for the pcb to count each revolution of the small magnet and work out how many revolutions per minute it is turning. If the small magnet mentioned in the last paragraph has broken, or come loose and dropped off, then the tacho coil won’t be able to pick up any signal from it and won’t detect that the motor is turning. This can also cause the error 7. It’s a relatively common cause in fact. The pcb knows it’s sending power to the motor and that it hasn’t detected any other fault on the motor – but it can’t detect that it’s running. In the photo above you can see at the top of the motor a typical tacho coil set up. Through a comment on this article I’ve been shown another web site which has some good photos of a typical motor and the tacho coil. It even shows one of the tacho coil clips that hold the coil in place (photos 9 and 10) – Kleiner Ring, gro�e Wirkung Waschmaschine mit Schleudertrauma. However, not all tacho coil clips are exactly the same (see the photo embedded above), but they should all have something holding the coil in place. Unfortunately these clips are rarely available as spares so unless you can cleverly and safely improvise a way to secure the coil in place (remember the motor will get hot during use) you won’t be able to repair it. Working fine, but have ordered a new coil, just in case. Thanks for the feedback. Glad the article helped. Good move to replace the coil, the superglue could eventually fail when the motor gets hot and shakes around. I had error message 7 displayed on my Hoover AI130. As soon as the drum strated to rotate, it would go to full speed immediately, stopping a few seconds later with the error code displayed. The fault was a split Taco (Tacho) magnet. This was not rotating with the motor shaft. Replacing the magnet fixed the fault (it had to be firmly Araldited onto the motor shaft). As a gas engineer i like to take on any of my home appliances and with this blog i succeded. As stated just ley your hoover on its back remove the black cardboard and strenght bar, look at the end of the motor for a round pepper pot like cap with a 2 wired white plastic connector block (yellow wires). Ease it out carefully and check the magnet inside has’nt come loose like mine had. If so screw it back into the motor push the cap back on it and you’ve just saved yourself £80 call out charge. I’ve recently bought a Hoover VisionHD W966DP-80 washer drier from Dixons. I’m now on my 3rd machine as all of them when doing a drying cycle finish on error code 7 – locking the door until the mains is cut. When turned back on (even after an hour), they start the same programme again, *no matter what the dial is set to*. Turning the dial to off at this point cancels it and the machine can be used again. The fact that I have had three of these machines with the same fault says to me it is a generic design problem, but neither Hoover or Dixons have admitted as such. Is anyone else having the problem? Thank you so much! Found your site today and my son fixed my machine tonight….Can now start washing again. The magnet had come loose. Mike the gasman made it sound so simple! and it was. Many thanks Ruth. Glad to have helped. I had a Error 7 on a Hoover W966DP-80. Apparently there was a software error on the programme board. The board was replaced which resolved the Error 7. But I now have Error 11!! Error code 11 on a Hoover Nextra means, “faulty dryer board or wiring” but I need to point out that the Hoover Vision is a different range to the Hoover Nextra and could have different error code explanations. Dave posted earlier regarding his Hoover VisionHD W966DP-80 machines which displayed error code 7 but his motor appears to have continued working OK which if the tacho magnet had dropped off it wouldn’t. Combined with your Vision displaying error 7 and needing a new control module it seems to me that their error codes are different to the one described in my article about the Nextra range. Unfortunately I don’t have any error codes for the Hoover VisionHD. my washer is doing exactly what is being described..
how do i get the back off my machine to fix this fault? it looks all bolted on at the back of machine, and i cannot afford at present for an engineer to come out, and i really need my washing machine to work. is it an easy thing to fix? You can’t take the back off many modern washing machines sharon, many just have a small inspection hatch from the drum pulley. I used to access the motor by laying the machine on its back but DIY jobs are potentially fraught with problems if you don’t know what you are doing. Even laying it down can cause problems if you haven’t disconnected all the hoses, and of course it must be disconnected from the mains supply too. The tacho coil coming off has been a fairly common problem, but without the proper clip to fix it back in place (which isn’t available as a spare part in most cases) you can only either fit a new motor (which is ridiculously expensive) or use ingenuity to fix in on in a way that won’t cause any side effects. If the old clip is still there it may be possible to refit it but obviously it could come off again. If the tacho coil is still in place it must be something else. hi, thankyou for the reply. my washer is under insurance, so i will contact them and get them to send someone out to fix it, hopefully they can, because i dont want to have to get a new machine. as far as you know, if it is the tacho, which to me it seems like it could well be, would it affect all washes?, because my daily 44” min wash still works, but all my main washes on the opposite side of the dial, and any other washes don’t. In my experience if the tacho coil comes off then the control module loses all control of the motor, and every time it sends power to the motor it only spins. If it wasn’t for the machine refusing to work and showing an error code the motor could spin uncontrollably and with a heavy load inside that can damage the machine. If the motor turns the drum at normal speed on wash then as far as I can see the tacho coil must still be attached because the machine can’t control the motor without feedback from the tacho coil. Error codes sometimes have different causes to those listed in the error code list. Maybe there’s a problem with the control module or connections somewhere. well, i am at a total loss as to what it could be then. could it be the electronics? sending the wrong info on certain washes to the motor etc…? I got an error 7 after using the dryer on my Hoover Washer Dryer. The power was turned off in the middle of the program, but when the power came back it seemed to work fine. But after finishing the program (apparently nothing was wrong), I got the error 7. Could it be the power loss causing this error? Should I try using it, or should I contact repair service? On a different note, the dryer function doesn’t work – turns but doesn’t heat up. Its a Hoover Nextra 8 washer/dryer – any ideas???? When you take the tachometer of there is two cage type things should they be fixed together? Anonymous: The tachometer is a coil within a metal housing. It’s all one piece. Hi, I have the same problem as Mike the gasman but his solution doesn’t fix it. Basically, my machine (Hoover Nextra Washer Dryer) spins and begins to fill up with water and then I get Error 7. Same happens on dry cycle (without the water obviously). I have repaired the machine myself before, I opened it up, checked the brushes and tacho coil. The drum is spinning and the motor working but it sounds like it’s out of control. I found this German site http://www.dennis-knake.de/2007/02/25/kleiner-ring-grose-wirkung-waschmaschine-mit-schleudertrauma/ You can translate it pretty well on google translate, but you don’t need to to answer my query. If you look at his pictures, the third last picture showing the tacho coil cap – this is what mine looks like. But in the next picture he says that he found a retainer clip after he’d put it back together and that this sits on top of the tacho coil cap and holds it in place. So, does anyone who has opened their Hoover Nextra machine know if there is one of these clips sitting on top of their tacho coil cap? This would save me from going mad! I don’t think you can by these as spares just in case anyone else is missing theirs. Thanks anonymous dublin: Photos 9 and 10 give a good view of the clip that holds the tacho coil in place. These clips are rarely available as spares unfortunately. If you can’t cleverly improvise no repair can be done. Another cause related to this fault is if the tacho coil is still in place, but the small magnet that runs inside the coil has come unscrewed off the end of the armature shaft, which will equally prevent the electronics from counting the revolutions of the armature via the tacho coil and could give error code 7.
i got it working in the end. just tried a few different programs and it seems to work now. I don’t have a clip on the coil and I don’t think there was one on it. Is there always one on these washer dryers? The coil has to be secured somehow. If you can’t pull it off (don’t try too hard) then presumably it is secured somehow. If not the chances are it will come off sooner or later. Sorry, should have also mentioned that my coil was not secured using the clip. There was a raised part inside the coil housing which makes it a tight fit. The coil can be prised out with a screwdriver (carefully) then pressed back in. Be carful when reinserting that you don’t damage the coil if it fits in this was, as tapping it in may damage it. Although it was tight, I was able to press it in with my fingers. Thanks for this artical, helped me immensely in repairing my machine. I was getting intermittant error 7s on my Hoover washing machine. This artical pointed me to the Tacho which I checked and tested. The magnet was secure on the back of the shaft and the coil tested OK. To test, put a miltimeter over the tacho coil and measure the resistance which should be about 170 ohms. You can also test the operation by measuring milli Volts over the coil and spinnimg the motor shaft by hand. As the shaft turns you should see the voltage fluctuation as the magnet on the shaft induces voltage in the coil. After testing I reassembled then it would work for between 1 and 3 cycles, always failing on the rinse cycle when it did fail. I eventually tracked it down to broken cable. Where the yellow wires enter the coil, if I wiggle them and measure resistance, the coil would sometimes go open circuit. I ordered a replacement coil (about £24 delivered) and the machine has worked flawlessly for over a week now. Hope this helps others to test the coil and check for broken wires!